A superb mix Of detail retrieval and musicality. Although I have long valued the role of audio cables in the home listening experience, I have been skeptical about the sonic importance of USB cables. My untutored reasoning was essentially that although interconnects, speaker cables and power cords produced easily audible sonic differences, a USB cable was simply transmitting digital information – zeros and ones – that the DAC then converted into musical signals. Under that assumption, the DAC was the key to good digital sound, not the USB cable. My first attempts at computer audio were limited to ripping CDs onto my Macintosh, and then playing those files through a 15-foot USB cable into a DAC. That sounded pretty good, and sometimes I found the ripped version could sound a bit cleaner than the source CD. But iTunes was such a clunky and unsatisfying program that I eventually gave up and went back to playing CDs. In either case however, I still greatly preferred listening to my analog system. Of course in those days I had not yet experienced any truly high-resolution digital audio. Things began to change when I reviewed the LampizatOr Level 4 Generation 5 DAC. That review discussed the DAC when playing CDs via a transport. The completion of that review – also in this issue – covers its performance with high-resolution PCM and DSD computer files. Initially I connected the computer to the DAC via an inexpensive (15 feet/$60) generic USB cable. Using the high-resolution computer files yielded impressive results, far better than I had gotten from ripping CDs onto iTunes. Compared to a CD, now I typically got wider frequency response, much more impactful dynamics, and typically far more realistic imaging and soundscaping. But still, I found myself much more fully involved with the music when playing LPs. So I began to wonder if my generic USB cable was limiting the capabilities of the LampizatOr DAC. While he was visiting me during the Spring 2015 AXPONA show, my friend Jeff Wells, designer of my Innamorata Signature power amplifiers, kept insisting that a better USB cable would be a significant upgrade. Jeff suggested the DanaCable USB. At the same show, I talked to LampizatOr designer Lukasz Fikus and North American distributor Fred Ainsley, who also recommended the DanaCable USB, which they were using for the show and are recommending to their customers. I needed a longer-than-usual cable, as my computer setup is on a table 4 feet in front of my equipment racks. Designer Dana Robbins agreed to build me a 12 foot USB cable that would work in my configuration. Anything longer, he said, would deteriorate the quality of the sound, especially limiting frequency response. I also spoke to Vinh Vu of Gingko Audio, distributor of DanaCable, who confirmed that I could audition the cable a month and return it if if I was not satisfied. About a week later the new USB cable arrived. The DanaCable USB is a USB 2.0 cable with type A connector at the computer and type B at the DAC. All DanaCable products are handcrafted in Colorado Springs, CO. The standard DanaCable USB is offered in a 2M length. MSRP for the 2M USB cable is $895.00. When I spoke to Dana Robbins, he told me that they are considering longer ones in the near future, possibly adding 2.5M and 3M versions. The DanaCable USB uses recording studio digital transmission cable with copper conductors to achieve superior signal integrity and fast rise time. Dana Robbins asserts that the cable's unique shielding, which isolates the return from the + conductor, keeps noise from the outside world from coupling to the data lines. Even more importantly, internal shielding isolates the signal conductor from the cable’s +5V line. This combination of shielded conductors results in super-low jitter performance. In my listening room the computer audio station is on a small table four feet in front of the equipment rack that holds the LampizatOr DAC. Because I am physically unable to go behind my equipment racks, which are about five feet from the wall, I have the DAC on a low shelf so that I can reach its rear panel, which has toggle switches that are needed to select digital input and power on/off. Choosing to play PCM or DSD files is done via the illuminated pushbutton on the DAC’s front panel. The computer is a Windows laptop with an outboard disk drive loaded with over 7,000 digital files. I also use a 27-inch monitor so that I can magnify listings to compensate for my impaired vision. I use Jriver software to organize and access computer files. The 12-foot DanaCable USB enables me to route the cable to let me roll my wheelchair up to the DAC without running over the cable. Somewhat to my surprise, the sound through the DanaCable USB was notably better than through my original USB cable from the first moment. But, as with all the cables I have used, the new USB cable needed quite a bit of burn-in to reach its full potential. So I set the JRiver software to play continuously over 10 days, simply turning down the volume when I was not listening. This process also burned in the DSD section of the DAC, which had not been used at all in playing CDs. The following observations are based on the sound of the system after everything was fully burned in. The Mahler "Resurrection" Symphony No. 2 with Otto Klemperor leading the Philharmonia Orchestra & Chorus is one of the greatest Mahler recordings. The sound on the American Angel LPs was thin and constricted, and the subsequent CD versions were all inadequate to convey the essence of this massive work. But my 1962 EMI LPs have for decades been one of my most useful demonstration recordings, even though those LPs are more than 50 years old. A few months ago my colleague Max Westler covered that past history in his review of the DSD download. I had done a comparison of the EMI LPs and the DSD files a few months ago, when I was still using the initial generic USB cable. Although it was a fairly close call, I preferred the LPs, which sounded more harmonically rich and simply more musical than the DSD version. But with the DanaCable USB, I find that the DSD files have much more sweetness and musicality, and of course the background is much quieter than my EMI LPs. Patricia Barber's Modern Cool and Nightclub are among my favorite jazz recordings. Barber's great voice, brilliant vocal and piano phrasing, and masterly arranging for her combo make her one of the great jazz artists of our time. (One benefit of living in Chicago is being able to hear her live any week when she's not on the road.) I have those recordings on LP, on original and remastered CDs, and in DSD files. Again, the LPs have been the closest approximation to her live performances, but I now give a slight edge to the DSD files after hearing them with the DanaCable USB and the LampizatOr DAC. Experiencing the DanaCable USB has debunked my original untutored idea that a USB cable could have little or no effect on the listening experience. In my original review of the LampizatOr DAC, I commented that it brought the CD listening experience close enough to analog to tempt me into being lazy and listening to CDs more of the time. But ultimately I still went back to LPs when I wanted to hear my system at its absolute best. But as the above-cited examples show, the experience of computer audio with the LampizatOr/DanaCable USB combination has reached parity – and sometimes superiority – compared to my analog system. It makes music in any genre sound relaxed, harmonically full and rich, and effortlessly musical. 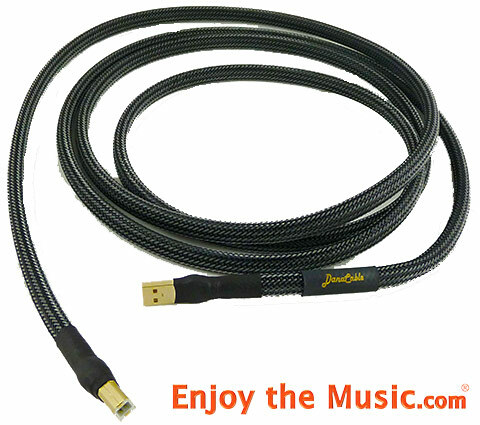 For anyone who wants to hear the best from computer audio, this cable is at the least a must-audition. Mine is here for the long haul. Warranty: One year parts/labor, 30-day audition money-back guarantee. Price: $895 for two-meter, with other lengths available upon request.